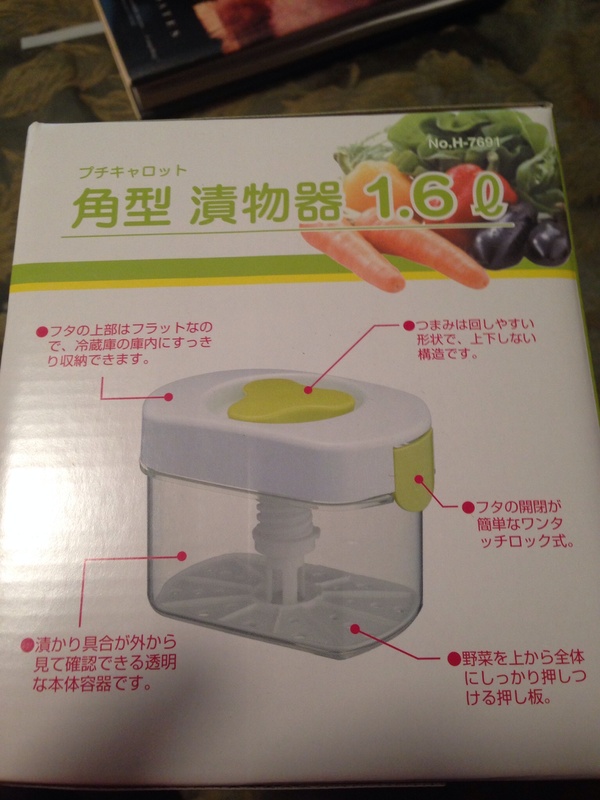 I received a surprise gift from my brother Sam to help me with my pickling adventures! 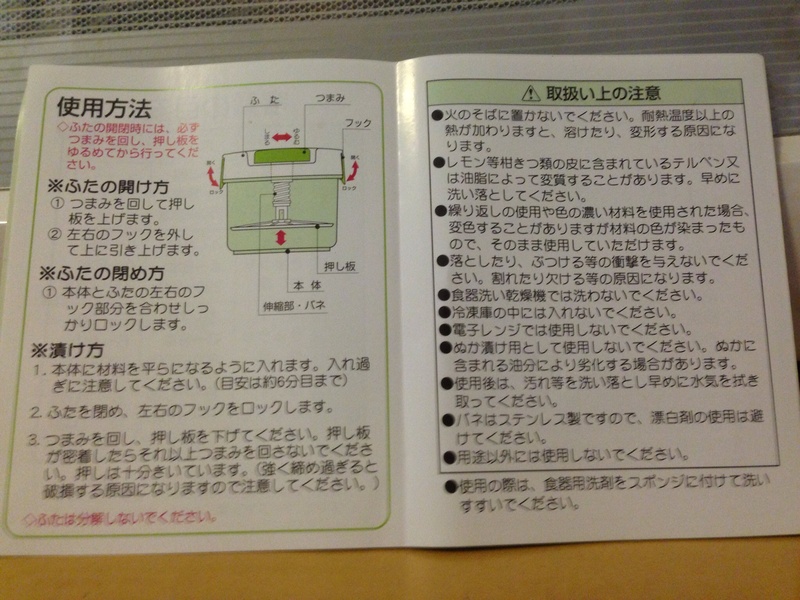 Unfortunately the instructions are in Japanese, I am Sansei I don’t read Nihongo! But I don’t want to let my brother down so I tried to make pickles without direction from memory of watching my dad and from my discussions with my brother. These are couple of cucumbers from a friends garden with some salt a little miso and the secret ingredient. She and her husband are not Japanese but love Japanese food and are my guinea pigs this go around This is after about one hour. 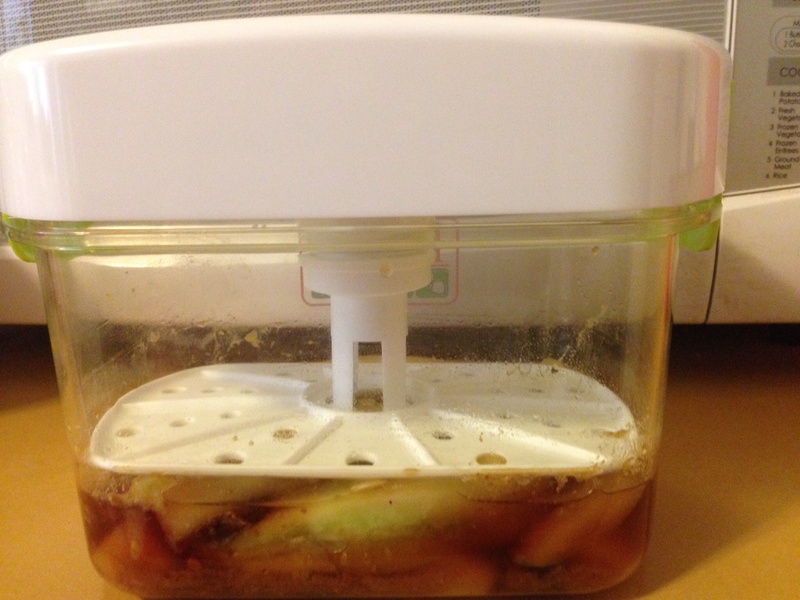 The pickles need a slight pressure so you turn the handle and the little platform comes down and applies pressure. The way my dad used to do this is he get a plate, a clean rock, put the plate on top of the vegetables the rock on top of the plate and voila there was the necessary pressure. Here are the pickles after about three hours! They turned out a little too salty I had to rinse them off thoroughly add a little mirin (a Japanese sweet wine) and some more of the secret ingredient and let them press for about 12 hours. I thought this was a pretty good result slightly sweet slightly salty slightly a little of the secret ingredient slightly crunchy. Perfect for eating with hot rice! I’ll let you know what the secret ingredient is when I have the results of the tasting from my friend. 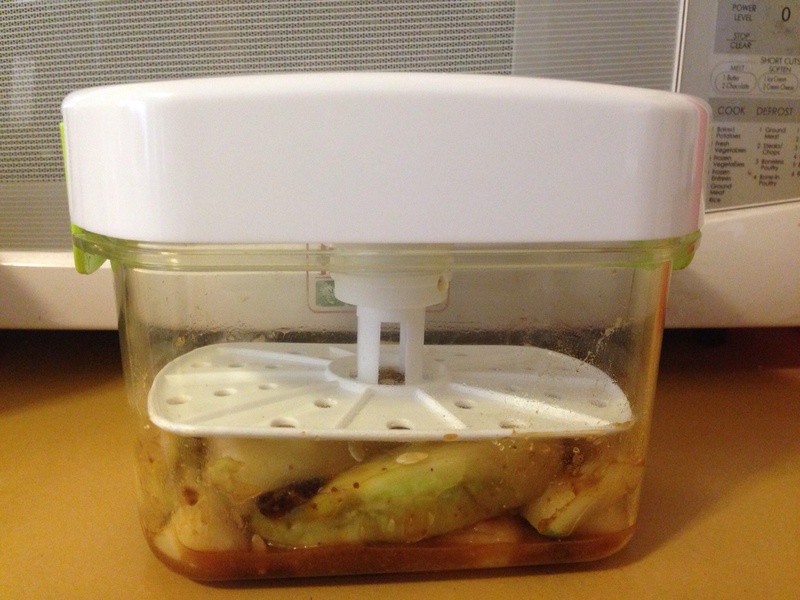 Posted on August 13, 2014 October 17, 2014 Categories RecipesTags Food, Japanese, Pickle, Recipe, SecretLeave a comment on Surprise gift! My sister love butterflies. I bought myself a membership to the Butterfly Pavilion here in Colorado. Hang out with live butterflies! 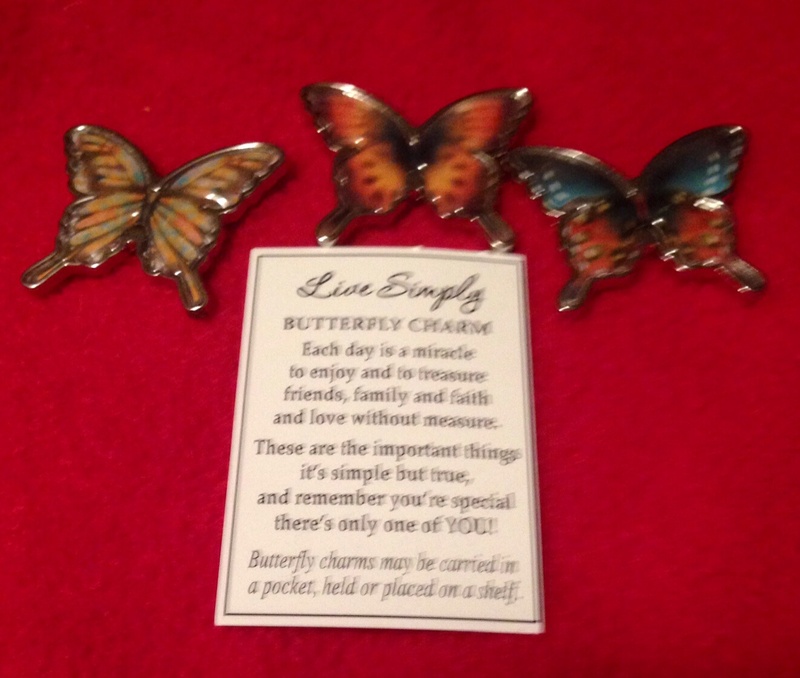 The gift shop had these neat little butterfly trinkets. They had these cute little bumblebees too. I needed something to put them in, I wanted to see them every day to just keep my sister close. I planned I’m looking for a fancy little bowl somewhere but my sister was so thrifty I tried to thrift store first. 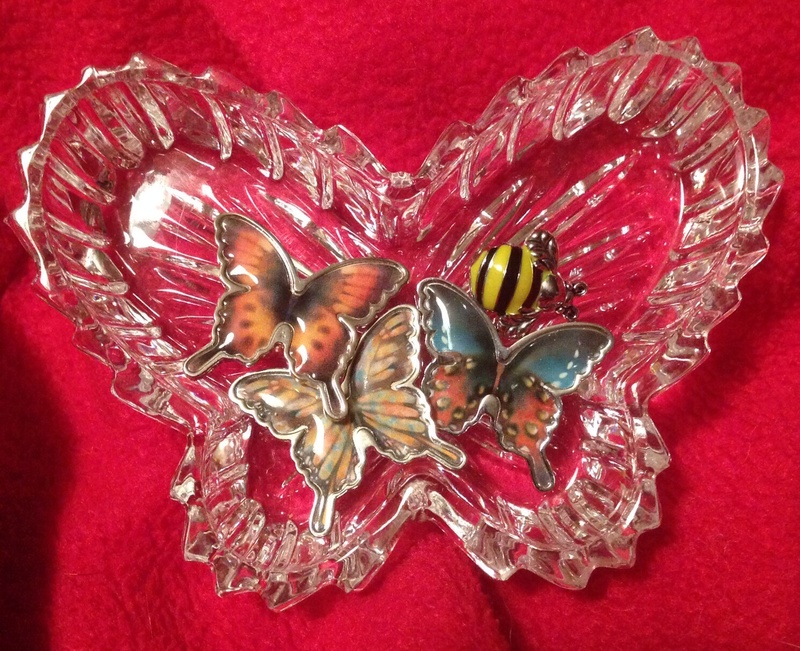 Here was the perfect little glass butterfly dish which I rescued from the thrift store for pennies. My sister would’ve been pleased! 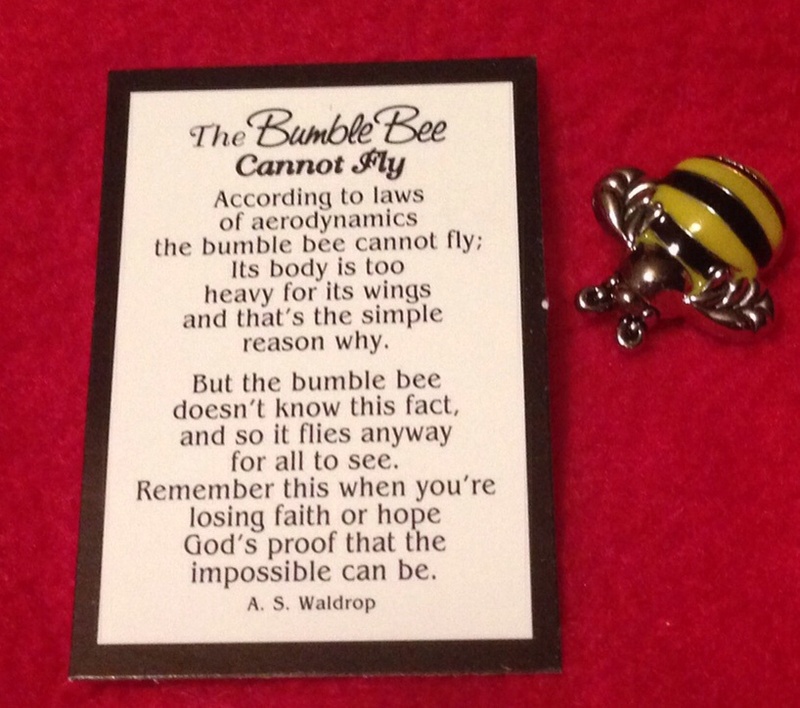 So these little trinkets are on my desk at work to just put a smile on my face when I need it. By crashing another family get together I was able to test three versions of Hawaiian macaroni salad on Ruby Hada’s family. Ham, chicken and seafood. The favorite was ham followed closely by chicken and believe it or not seafood came in last. HAM: about 1 cup Chopped ham and the secret ingredient. CHICKEN: one large can of chicken and the juice it came in and the secret ingredient. SEAFOOD: about 1 cup imitation crab and the secret ingredient. What is the secret ingredient? Hondashi! A powdered soup stock much like chicken or beef bouillon. It sometimes is known as bonito flavored soup stock. Make sure you get one without MSG. Use sparingly for this huge recipe 1/2 to 1 teaspoon of this soup stock. I did leave out the salt as people are trying to avoid salt and I forgot to put the pepper, sigh. A little salt and pepper would’ve been nice, don’t skip. I did use the milk to keep it more moist and I used sweet pickle relish instead of the vinegar and sugar. Oh yeah really cook the macaroni till they’re fat and soft. This is very important to make your traditional Hawaiian macaroni salad. Ruby’s family was getting together for a visit with her daughter and grandchildren, Visiting from San Francisco. This family was warm and friendly even though I was crashing yet another one of their get-togethers. A special treat was Ruby’s niece, the pastry chef, made a wonderful cheesecake with homemade chocolate and caramel sauce! Yum! I have another recipe using hondashi from my brother-in-law’s mother Grace Motoyoshi. I’ll be sharing that recipe and the story of how I got it with you soon! Macaroni salad is a staple of the Hawaii-style meal. Typically served in a mound with a mound of white rice and with barbecue chicken or meat. The macaroni salad is savory and mayonnaise rich. The basic salad is easy and the recipe can be varied to individual taste. Cook 1 pound elbow macaroni until soft and fat. Stir in ¼ cup very finely grated onion. It should be liquidy. Approximately 2½ cups of mayo (not salad dressing) more or less. 1/2 cup apple cider vinegar added to hot pasta and other ingredients plus 1 Tbsp brown sugar added after cooled. Salt and pepper, to taste. Stir well; refrigerate. Posted on August 1, 2014 October 17, 2014 Categories RecipesTags Hawaiian, Recipe, SecretLeave a comment on Hawaiian Macaroni Salad results! Has some small or large thing happened to you that really made your day? Lifted your spirits or made life a little easier for you? If you have a thought to share please email me at sanseilife@gmail.com with your story. A friend of mine recently lost her husband. She was at dinner with her parents talking about how much they missed him. When it came time to pay the bill their waitress told them somebody had picked up their check she pointed to a woman leaving with her small children. A stranger. The woman must have overheard them talking and wanted to make their day a little brighter. Her thoughtfulness made them feel not so alone and did make their day a lot brighter. Another friend of mine asked me to share with you a thought: Treat those who wait on you such as waitresses or grocery store clerks with extra thoughtfulness. They have demanding jobs and sometimes people don’t give them a second thought, in fact they are invisible sometimes. A simple thank you or smile may go a long way to make their day. Welcome to Sansei Life! A blog exploring and learning about the Asian community in Denver.When I was much younger I tried a new Japanese restaurant in Arvada called Namiko’s for a sushi snack. It was very good. I got into a conversation with Yuri the owner and she ended up offering me a part time job on weekends. I spent most of the first evening running to Yuri asking her what the various dishes were and what was in them and what they tasted like. In exasperation Yuri asked me if I was Japanese! She could not understand how a Japanese did not know simple restaurant fare. That is when I really understood that I was a Sansei out of touch with my culture. I am ready to experience and learn about today’s Asian culture. Please join me as I explore the rich Asian culture that is part of Denver and Colorado’s unique makeup.Please share your stories and ideas on what you’d like to hear more about, events and what is happening in Denver in the Asian community.